Soon after boarding the seven thirty train from Mughal Serai (Varanasi) to Patna, I ordered egg and toast and drank tea from a mini thermos flask, watching the flat green countryside roll by. I had learnt to override my prejudice regarding food ordered in the train. But try not to visit the kitchen wagon because you might lose your appetite after that. The train approached Patna on schedule exactly in three hours and 25 minutes. I reached the exit door loaded with my backpack ready to disembark when the train braked to halt just outside the station waiting for line clearance signal. Another tallish passenger wearing very white Indian shirt and pajamas had occupied the rest of the space with his baggage. Nothing happened except that minutes continued to tick. I was in no hurry. My pack found a place on the floor and I started to talk with the gentleman. It did not take long before I learned that he lived in Patna, the Capital of Bihar State, and that he had just retired as its Director of Education. For nearly one hour while the train awaited clearance, we exchanged talk about every thing pertaining to education and its bearing on development in Bihar, India and the world. Did the train stop knowingly so that could learn from this unassuming person? The value of delayed passenger trains is always underestimated! He alerted me that Patna does not attract many tourists. As Buddha had predicted in 500BC, two centuries later, this city under its old name of Pataliputra, became the capital of India under Ashoka the Great. I decided to see the remains of the old capital first. Bewitched by Indian beauties, President Clinton did not phone me in Varanasi! To compensate, I decided to stay in Hotel President in Patna. I quickly descended to the dinning room. Most of the restaurants I have been to in India are dimly lit. This one was so dark that I could hardly read the scanty menu. Is the dimness intended to stop looking at others wives, or replacement of wives? Or is it to conceal big holes in the tattered carpet? Or is it to mask the quality of food being served and insects that might have fallen in it? A cold beer helped me to forget all those questions and gulp down half-cooked rice and lentils- tandoori chicken was not chewable. 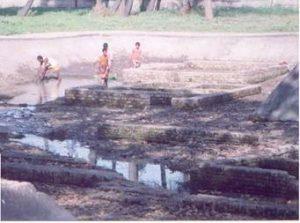 I walked back to the rail station and hired a 3-wheeler to take me eastward to Kumrahar to see xcavations of Pataliputra. Expecting to see something like Greek and Roman edifices I was disappointed. There must be much more than those few lowly foundations uncovered so far. I had a mission to accomplish in Patna: my uncle in Chandigarh gave me his new book to donate to the Sikh Temple (Patna Saheb) which is 4km further east. 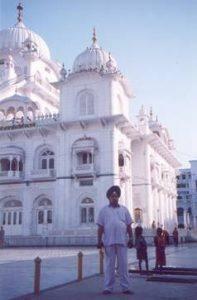 The white marble temple built by Maharaja Ranjit Singh pleases the eye especially its clean compound. The pot-bellied Manager received me courteously and honoured me with a scarf and a bun (parsad) from the temple kitchen. It was very tasty indeed. Train the residents how to use and keep them clean and organize supervision. Second year would cover the next 10 to 20 metres and so on. How pleased would be the Gurus if their Sikhs ventured out and undertook social service beyond the temple kitchen and extended their humility beyond wiping shoes of devotees? In the evening I walked to the west of Gandhi Maidan to see sunset over the Ganges. I climbed 142 steps to the top of beehive-shaped Golghar, a 1786 British granary. To go to the riverbank, I crossed a compound with a strange-looking unfinished concrete construction in its middle. It looked like a wartime bunker composed of a number cubes standing on edges one over the other. One young man standing in the balcony between two cubes told me that late Mrs. Gandhi, Prime Minister of India, had ordered its construction. Now it provides shelter to local policemen. They could not tell me why it was built like a bunker. Did Mrs. Gandhi make provision to hide herself should dire days befall? It was already dark when I returned to my room. I could not see the rusty old curtains or the patches of wall paint. I switched on the TV to see what was Clinton up to in India. Who do I see? Ram Godoomal a Sindhi friend who lived in Geneva some ten years ago. He is an enthusiastic Christian involved in social help projects in London. BBC was interviewing him because he was a candidate for election as Mayor of London. What a coincidence! Early next morning (Wednesday 22 March), I went to Khuda Bakhsh Oriental Library to see the only books to survive the sacking of the Moorish University of Cordoba in Spain. I was curious and wanted to see the Quran inscribed in a book only 25mm wide. The ordinary mortals in the library guided me to the manager himself who received me very courteously. He could not show me what I had come to see; but what he told me that morning I would have never found out – a rare opportunity! Bakhsh was a lawyer born in 1842. His foster mother was a Brahmin woman, who breast-fed him. In recognition of her love, he never ate beef, although permitted in Islam; nor did his son Khuda. Bakhsh, an intellectual, was keenly interested in collecting and preserving manuscripts and works of art. He greatly valued the need for archives and reading facilities for all people. In 1876, his last wish to his son, Khuda, was that he should collect manuscripts and publications and set up a multicultural library. Khuda engaged people for 50 rupees a month and sent them to Syria, Iraq, Persia, Spain, and North Africa. They brought back some rare and unique Arabic and Persian manuscripts including a book on surgery from Cordoba Spain. It details surgical instruments the types of which are still in use. Khuda, also a lawyer, launched a similar campaign within India. 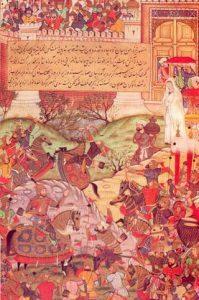 He paid the cost of return journey and price of the manuscript brought to him. One of the most famous he acquired is Tarikh-e Khandan-e Timuria (Timur Nama), a stupendously illustrated history of Timur family from Uzbekistan down to Akbar in India. Akbar had requisitioned its preparation. It is a priceless work of art. Sometimes Khuda even bought manuscripts, which he knew had been stolen from his collection. He spent all his savings on this pursuit and died a poor sick man. The Government (then British) loaned him 8000 Rupees to get medical treatment. Now the library is well staffed, funded by the Federal Government and complemented with 50,000 Rupees from the State Government. Catalogues are being scanned and would be put on Internet. A quarterly journal publishes good quality articles in English and Urdu. Patna might not be a great tourist attraction, but I departed a more cultured person carrying a booklet containing 12 reproductions from Timur Nama.